The library is located in the central block of high school, on the second floor. Our front door can be found in the cross corridor above Central Administration. How do I contact the high school library? Can we eat in the library? Yes! You can eat whatever you'd like; however, the library is carpeted and we ask that you use extra caution with liquids. If something were to spill, please use the cleaning supplies below the circulation desk. 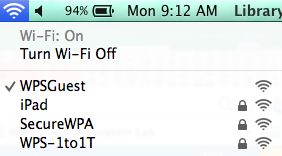 How do I logon to the guest wireless network? Click on your preferred Internet browser (IE, Chrome, Firefox, Safari, etc.) and start searching the web! If you are a Waltham Public Schools employee and would like to login to the WPS-1to1T network using your WPS (school) username and password, your WPS username is your first name and last name (no spaces or capital letters). Example: kevinlong. Your password is the same password that you use to login to the school computers. What do I need to do when leaving the library? Please log-off of the presenter's computer and ask participants to put away all laptops. Lock the library's laptop cart and put the keys back.